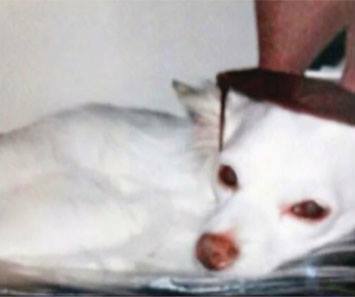 Little did a nearly blind chihuahua’s dog dad know that simply forgetting to use his turn signal would lead to the death of Guero, his 15-year-old dog. No, the man’s failure to signal when changing lanes on Highway 59 near Collingsworth, Texas, on July 13 did not result in a horrific crash. A Houston Police Department (HPD) officer pulled him over for the minor violation, found drugs in the car, and arrested the man and his passenger. After summoning a tow truck for the car, the HPD officer picked up tiny Guero – who was nearly blind due to cataracts – and set him down alongside the road. “My husband pleaded with the officer to let him call someone to come get Guero, and asked him to call BARC (Houston’s animal shelter), but he said it wasn’t his problem, that the dog would be fine,” Josie Garcia, Guero’s dog mom, told KTRK. She said the drugs belonged to the passenger, not her husband. Garcia posted Lost signs with Guero’s picture around the area, and three days later got a phone call from someone who found her dog. Guero had been hit by a car and was lying dead on a shoulder of the road. Garcia wrapped his body in a blanket and took him home to bury him. “I felt so much pain like I never knew I had,” she told KTRK. Garcia filed a complaint against the officer with the HPD internal affairs department. Earlier this week, she told her story to the Houston city council. City council members are looking into city policies regarding pets involved in police procedures. The officer in this case has not been identified or made any comment regarding the incident. The charges against Garcia’s husband were dropped – just as Guero apparently was alongside that busy highway.